A 100-mile drive from Omaha, Nebraska, Greater Sioux City—or “Siouxland” as the nearly 125,000 locals know it—straddles the borders of three states. (For a display of all city demographics, click here. Technically speaking, Sioux City’s metropolitan statistical area spans two counties in Iowa, two in Nebraska and one county in South Dakota. 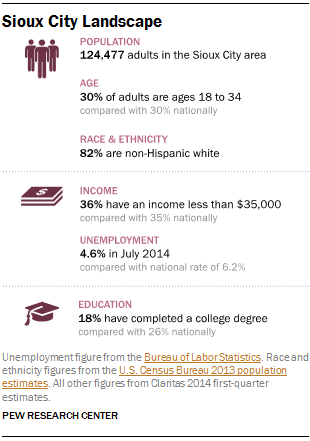 is a growing Hispanic population (12%). The city has promoted housing growth, establishing tax incentives for new development in recent years. The region is still struggling to find a solid, economic driver, however. While top employers—Tyson Fresh Meats, Mercy Medical Center, Sioux City Community School District, UnityPoint Health and the city itself—provide a solid workforce, 12% of the area’s households have an income of less than $15,000. The Sioux City region is a small media market, centered largely around its daily newspaper and broadcast TV channels. Researchers identified 31 news providers serving the region, across print, radio, television and digital platforms. Of these, 24 would be considered dedicated news operations. The other seven serve other civic roles, but provide some news-related content on a regular basis within their other offerings. Among the journalistic operations, 14 are print-based publications—a daily paper and some community weeklies, as well as a few specialty outlets and a local university newspaper. Three television outlets and four radio stations air news. Researchers identified three web-only outlets and blogs providing at least occasional coverage of the region. In addition to the news operations, researchers identified seven local government and municipal websites distributing news releases and civic information. The city’s daily newspaper, the Sioux City Journal, is one of the city’s key news sources. The paper, which printed its first edition in 1864, far exceeds other local print publications with a daily circulation of 26,626. Predating the waves of convergence that would define the news industry in the early 2000s, the Sioux City Journal was part of a unified newsgathering operation as early as 1954. NBC affiliate KTIV and news-talk radio station KSCJ (whose call letters reflect its affiliation with the paper) were referred to as the electronic “arm” of the newspaper. Lee Enterprises, the current owner of the Journal, sold off the TV station in 1989 (now owned by family company Quincy Newspapers Inc.) and the radio station in 1996 (now owned by Powell Broadcasting and an affiliate of Radio Iowa). Even though the paper’s content sharing in broadcasting has since ceased, the Sioux City Journal continues to repurpose its works across multiple print and digital publications and platforms. The work of Journal reporters appears in the city’s business journal (Siouxland Business Journal), monthly lifestyles magazines (Siouxland Life and Siouxland Prime), a weekly real estate supplemental (Siouxland Homes) and a free newsstand tabloid (Weekender). On the digital side, the paper acts as the hub for several blogs, including SUX 911 (a crime blog; SUX is Sioux City’s designated airport code), and Politically Speaking (a blog covering the region’s public affairs news). The Journal manages an active website, updating it throughout the day, as it does with its Twitter feed and Facebook page. Of the three network websites serving the Siouxland region, the home pages of both the ABC and NBC affiliates (KCAU and KTIV, respectively) are updated several times a day. The shared website of the CBS and Fox affiliates (KMEG and KPTH) is updated less frequently than its competitors’ sites, but it is updated at least daily. Each outlet is active on both Twitter and Facebook. Of the five outlets studied in the Sioux City region featuring citizen content, two were local TV station websites. KCAU had a small section for photos from Facebook fans, and, at the time of analysis, KTIV had posted a “submitted” item on its home page—a picture of an osprey. Outside the compact downtown corridor of Sioux City, past the strip malls and small businesses, the landscape quickly turns to farms and rolling fields. The small communities that dot this landscape are served by a number of weekly community newspapers. There are nine of them, down from 11, after the Moville Record recently purchased two other local papers and consolidated the publications. 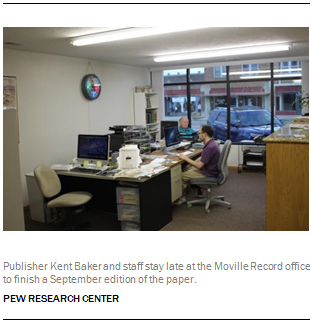 Kent Baker, the publisher of the Moville Record, spoke with the Pew Research Center about his paper’s coverage of schools and town meetings.18 “It’s unusual, in a small town, for there to be government coverage,” he said. 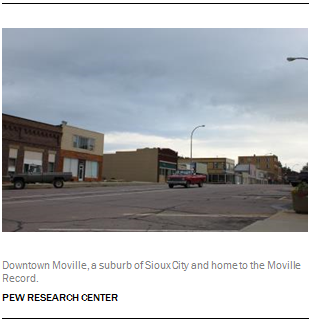 “People love it.” Moville is the biggest community his papers serve, with a population of about 1,600. It is a small community, but “we can always get news,” Baker said. Only one of the community papers—the Le Mars Daily Sentinel—had a designated space for user discussion on its home page, but during the period of analysis, no discussion was present. 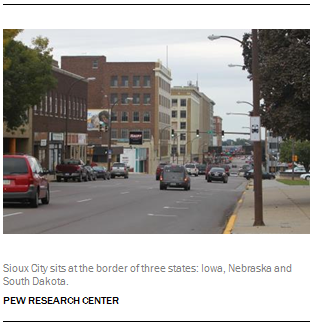 Niche and ethnic media are scarce in the Sioux City region. The Catholic Globe publishes a biweekly print edition as well as news briefs online. 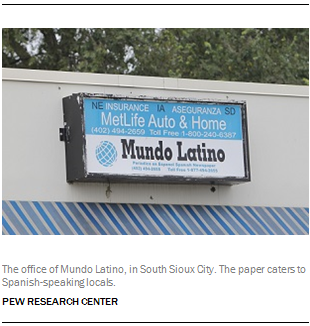 And one independent news outlet, Mundo Latino, targets Spanish speakers in Sioux City. Sandra Lopes-Gutierrez, who runs Mundo Latino, works out of a MetLife insurance agency that doubles as a newsroom where her niece serves as community reporter. Lopes-Gutierrez described the local Hispanic community as one cut off both culturally and geographically from Greater Sioux City.22 “The locals like Spanish TV,” she said, which they often get via satellite. That leaves some without access to local broadcast TV news in their homes. Lopes-Gutierrez says that the local Hispanic community stays largely on the Nebraska side of the river, where the Tyson chicken plant, a major employer, is located, and where the county feels friendlier. The other divide is generational. Lopes-Gutierrez notes that the younger Hispanics in her community are more active online than older people. But Mundo Latino is “not at that level.” She said that she lost her designer, and so her paper’s web presence has suffered. As host of the first in the nation presidential contest, Iowans are keenly attuned to political news, particularly on the national stage. 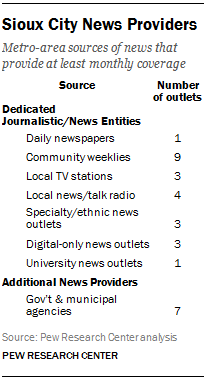 However, the Sioux City region lacks ideological and partisan-based digital news outlets that cover political news. And although there is a statewide nonprofit news outlet (IowaWatchdog.org), Sioux City does not have one of its own. Two of the Siouxland area digital-only sites are oriented around local lifestyle interests. Sioux City Now features local food, arts and entertainment news and regularly highlights a “Pet of the Week” available for adoption from a Siouxland animal rescue organization. The Sioux City home page of OurSports Central focuses exclusively on regular coverage of the local alternative and minor league teams (Sioux City Bandits, Sioux City Explorers and Sioux City Musketeers). And Iowa Cold Cases—which over time, has taken on a broader statewide focus—was launched in 2005 by a reporter for the Sioux City Journal as a website offering information on a handful of Sioux City cold case summaries. Today, Iowa Cold Cases is a uniquely structured site that works to educate the public about open crime cases by providing information and sharing resources. Four news-talk radio stations broadcast within Greater Sioux City. KSCJ, which syndicates programming from conservative hosts like Rush Limbaugh and Sean Hannity, also produces local news content as part of Radio Iowa, a newsgathering operation with more than 50 member affiliates. This network of stations is separate from National Public Radio, which also has a member affiliate in Sioux City, KWIT. In addition, KLEM and WNAX distribute local news programming in the communities surrounding Sioux City. While the local radio broadcasters have limited offerings on the Web, KLEM offered some kind of opportunity on its home page to submit a news tip: “Tell us something we should know about,” it says. Briar Cliff University, a small liberal arts institution in Sioux City, houses a student-produced publication called Cliff News, which has an active website when the university is in session. Pew Research analysts identified seven websites of local municipal and government agencies and officials that offered some form of regular news and civic information to local residents. Two websites belonged to the U.S. representatives of the relevant counties within the Sioux City area, and both of the sites sought to localize their home page content. The home page of Rep. Adrian Smith, representing the 3rd District of Nebraska tended to offer news items highlighting accomplishments of his constituents, while that of Rep. Kristi Noem, a representing the entirety of South Dakota’s at-large district, takes a slightly different approach and highlights her weekly column, which works to weave a hometown perspective into an issue of broader, national or international interest. Of the seven government or municipal home pages studied, four were not updated very frequently, but the home page of the Sioux City government was much more active, with weekly updates. Of all the government sites examined, the official website of Rep. Smith was updated the most frequently (several times a week). Both of the members of Congress on the list of news providers were present on Facebook and Twitter and had been active on those platforms in the week prior to the analysis. The local-level municipal government organizations examined, however, presented a much less uniform picture in their social media use. All three of the Sioux City organizations—the city government, the police department and the community school district—were present on Facebook and Twitter and active on both platforms in the week prior to our assessment. But the South Sioux City government in Nebraska had only a presence on Facebook and had not been active in the week it was analyzed. And the government of North Sioux City in South Dakota was not present on either Facebook or Twitter. 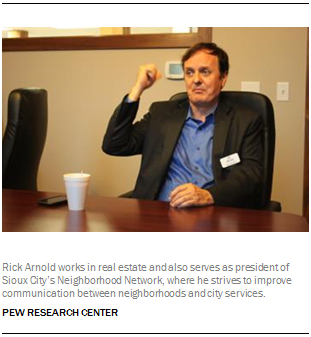 Rick Arnold, a local real estate agent and president of Sioux City’s Neighborhood Network, is trying to improve communication between Sioux City neighborhoods and municipal agencies. “City websites are getting better,” he told Pew Research.23 But the [communities] they’re trying to reach are less connected to social media.” Arnold noted that the local community volunteers and leaders are individuals who have the time and the drive to do so, but are not as Facebook-driven as those in the younger generation.